All Things Nice hosted the 6th edition of ‘Celebrating India’s Finest’, an evening recognizing winners of the “Indian Wine Consumer Choice Awards’ held in January 2018, presented by HT 48 hours, Hafele and Living Foodz in association with Lucaris Crystal Glassware and Cathay Pacific Airlines. It was hosted at the Hafele Design Centre SOBO on Friday, the 13th of April 2018. Wineries showcased their winning wines along with their entire portfolio and there was a free flow of all styles of wine produced in India, from full-bodied reds to fruity whites and dessert wines. All Things Nice hosted the 6th edition of ‘Celebrating India’s Finest’, an evening recognizing winners of the ‘Indian Wine Consumer Choice Awards’ held in January this year. Celebrating India’s Finest, presented by HT 48 Hours, Hafele and Living Foodz in association with Lucaris Crystal Glassware and Cathay Pacific Airlines was hosted at the Hafele Design Centre SOBO. Delectable hors d’oeuvres carefully curated by Eat Drink Design and paired with the wide selection of wine completed the indulgent experience. Guests also enjoyed a fine selection of Pascati Chocolates with the wines. Participating wineries included Casablanca, Charosa Wineries, Four Seasons Wines, Grover Zampa Vineyards, Oakwood Vineyards, Reveilo Wines, Soma Vineyards, Sula Vineyards, Syonaa Wines and The Daily Dose. 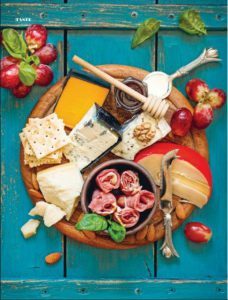 All Things Nice is based on the simple philosophy of savouring the pleasures of life, to provide an opportunity to relish your senses, tickle your taste buds and give in to the pleasures of indulgence. Read more. All Things Nice successfully organised the sixth edition of the Indian Wine Consumer’s Choice Awards popularly known in the industry as the IWCCA on 13th January 2018 at Sofitel Mumbai BKC. The aim of IWCCA is to give Indian consumers an opportunity to judge for themselves and on behalf of other consumers the best Indian wines available in the country. 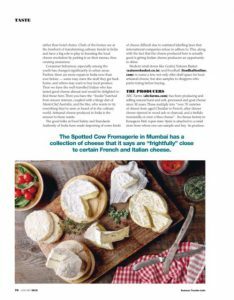 This annual accreditation, a brainchild of Sommelier Nikhil Agarwal (CEO – All Things Nice) opens the doors for consumers to acknowledge and celebrate new vintages and new wines launched in themarket as well as provide insight to wineries about what the burgeoning Indian market is inclined towards. The modus operandi involved bringing together all domestically produced wines in the premium category and had them efficiently categorized into a systematic tasting. The actual wine consumer was then invited to judge the wine.130 India wineries participated in the 6th edition of IWCCA. “The Indian Wine Consumer’s Choice Awards or IWCCA has established itself over the last 6 years and has become the go to guide for consumers and the HORECA trade who are interested in discovering Indian wine. It brings to light brands and styles that deserve recognition. The competition gives back the power to choose correctly to the consumer who has evolved over the years and is confident in their likes and dislikes. The IWCCA continues to create an independent list of quality wines chosen by consumers themselves. We are happy that wine enthusiasts from over 10 countries were part of the judging panel giving the competition a global palate” says Nikhil Agarwal, Sommelier and CEO of All Things Nice and the mastermind behind the IWCCA. The competition unearthed an independent list of India’s finest wines judged by the very people who drink them. The consumers taste the wines blind, unaware of the brand name or price point thereby allowing an unbiased judgment based purely on the quality of the wine itself. The winners of each category of the competition will be announced through the All Things Nice website and other media channels. Winners are accredited with IWCCA Gold, Silver and Bronze certifications and IWCCA medals. The 6th edition of Indian Consumer’s Choice Awards partnered with HT as official media partner, Living Foodz as the lifestyle partner, Sofitel Mumbai BKC as the hospitality partner, Veen asevent partner and Lucaris as the glassware partner. 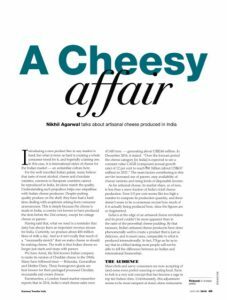 Business Traveller | A Cheesy Affair | Nikhil Agarwal talks about artisanal cheese produced in India. I like writing about Indian wine. I really do. I like it because it gives me an opportunity to share my passion for the Indian wine industry and to remove some of the misconceptions about it. My fellow wine aficionados or beginners you should know that there has been no better time for Indian wine that now. Over the last couple of decades we’ve come very far. We have wineries that are producing high quality wine in Maharashtra and Karnataka with more on their way. The pace at which quality has improved is staggering. This has happened for a number of reasons, for one, us as customers have become more aware and therefore more demanding. Two, there are more wineries vying for customer attention thereby being forced to raise their quality and marketing games. And of course we have wineries that just simply want to produce the very best! In fact there is a buzz about Indian wine happening in all corners of the world. So the next time you’re placing an order for a glass of your favourite grape variety perhaps you can choose one that’s made in our very own backyard. There are actually multiple wines from any given winery that deserve attention but to show you a range of styles and wineries I have selected one wine from each that I think are the best producers of wine in India at the moment. Lets start off with some bubbly. Chandon Brut Rose NV with aromas of ripe cherries, pink grapefruit and rose petals and interplay of red fruit and subtle citrus notes on the palate is the best sparkling India makes at the moment. Another sparkling that’s made in a different style that I like is Casablanca Brut NV. A generous fruity nose of kiwi and grape fruit layered with lime and floral undertones. On the palate, this wine is light bodied with flavours reminiscent of pear and green apple with a predominant acidic structure. I’m imagining endless bottles of both of the above with a non-stop supply of oysters and for something from India I’d be just as happy with some artisanal Brie locally produced in Pondicherry. In the whites Sula’s Riesling is fruity with hints of green apples, grapefruit, peach & honey. Supported with refreshing acid, lemon and notes of green apple. Perfectly balanced, this is a versatile wine which can be had with multiple cuisines, everything from something as simple as Tisriya (clams) in Indian masalas to a Chinese stir fry perhaps with a little spice. Another white that I particularly enjoy is Fratelli’s Vitae Tre a blend of Chenin Blanc, Gewurztraminer and Muller Thurgao. This is beautiful innovation that would be perfect with grilled Tiger Prawns or even prawns cooked in the tandoor. A wine I think exemplifies Indian Sauvignon Blanc is the one from York Winery. Light green hues with tropical fruit and vegetal characteristics. The last time I had this wine was at their winery along with some local Nasik fair however you could enjoy this with an Asparagus risotto. A wine that recently got my attention is Grover’s La Reserve Bianco; a beautiful nose of flowers and fruit, this wine is a lovely expression of Viognier. I’d do this with a cold watermelon salad with feta or pair it with something as simple as a curd and rice with a curry leaf. Hey, don’t knock it till you try the pairing. You have to try Vallonne Vineyards Rose. The colour itself is beautiful and the wine displays notes of cherry, plum, melons and berries. It’s full bodied, crisp and lively. I’d love this with an aromatic biryani and I’d love it with some tempura. Honestly its hard not to love this wine. In the reds the new kid on the block is Myra Misfit, a blend of Shiraz and Cabernet Sauvignon that has spent over 16 months in French oak. 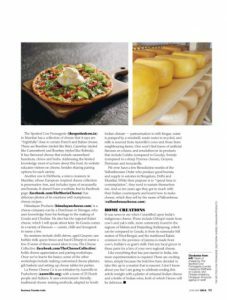 I like this wine with something as simple as a hard cheese, say aged Parmigiano Reggiano or with Peking duck. Zampa Chene is a blend of Tempranillo and Shiraz. It is deep and intense ruby red. With dark fruit aromas of blackberry, currant and ripe plums, complemented by hints of spices and oak bouquets such as vanilla, chocolate and roasted coffee beans. Dark fruit flavours with nuances of vanilla and cinnamon on the palate. This wine has the ability to stand up to a hearty north Indian meal so go for heavy daals or a mutton Rogan Josh if you like or pair it with a steak that’s done medium well. Charossa Reserve Tempranillo displays rich coconut, vanilla, chocolate & raspberry. Medium-bodied with a concentration of warm red fruit flavours like raspberry, strawberry & plum are distinctly ripe and fleshy. I do like this wine a lot and if you give me a lamb stew to go along with it I’m a happy camper. With Indian food I’d go with raan just as happily. Krsma Estates Sangiovese is brilliant as well. This one hails from the Hampi Hills in Karntaka displays cherries, spice and oak and you could enjoy this wine creamy pasta dishes or even Indian kebabs. Wait I can’t let you without ending on a sweet note. Reveilo’s Late Harvest Chenin Blanc with aromas of over ripe fruit, raisin grapes, dry figs and honey is a stunner. Try a chilled glass of this beauty with vanilla ice cream and fruits or perhaps even your everyday Rasgulla. Folks, the world of Indian wine is getting larger and if you give it attention you would realize that there is just so much to discover, all you need to do is simply tastes what’s on offer to believe it for yourself. 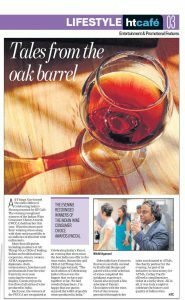 On a winter afternoon in January, about a hundred wine enthusiasts gathered at Sofitel, Bandra-Kurla Complex. Over hundred wine bottles, covered in aluminum foil to hide their labels, waited on a large table. Each judge was given wine glasses and a sheet of paper. This was the setting at the tasting session before the fourth edition of the Indian Wine Consumer’s Choice Awards (IWCCA) 2016, in association with HT48Hours. This year, the IWCCA, which is the only Indian accreditation that focusses on Indian vintage wines and new launches in the market, received the maximum number of participants yet – 136 wines from 21 labels. The wines were scored on three criteria: colour (1 to 3 points), aroma (1 to 7 points) and palate (1 to 10 points). The IWCCA invited opinions of consumers, the people who ultimately buy the wine, unlike international wine awards that invite professional wine tasters to judge their entries. “The awards should reflect the choice and preferences of the drinker in India. The event is also a platform for generating feedback for the wine producers in the country”, says Nikhil Agarwal, sommelier and CEO of All Things Nice, a wine and spirits consultancy that organises the awards. The participating wines were picked and segregated into different categories on the basis of their style: sparkling, white, red and dessert. 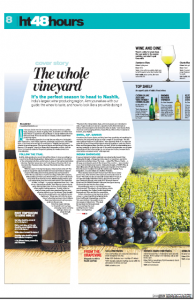 “The whites and reds were further divided on the basis of the grape varieties such as chardonnay, shiraz, merlot, chenin blanc and cabernet sauvignon,” says Agarwal. Total points for each wine were tallied and the top three wines, in each category, were segregated into gold, silver, and bronze winner categories.